Fruit based smoothies are an easy way to increase the consumption of fruits in our diet, and in turn nourish the body with essential nutrients. Unlike fruit juices, smoothies contain more vitamins, minerals and fiber, as we are adding the entire fruit. Making your own smoothies are easy too- you just need a blender, fruits and some milk or yogurt. Kiwi's are highly rich in antioxidants and a good source of vitamin C and dietary fiber. I have already shared a kiwi mango smoothie, and adapting from that I made a smoothie with kiwi, banana, handful of spinach leaves and used orange juice instead of apple juice. The smoothie was so delicious and perfect for the hot summer weather. Start your day with this nutritious and filling breakfast smoothie. Serve along with toast or sandwich to make a complete hearty breakfast. 1. Peel the skin of kiwi and chop into small pieces. Chop the banana into small pieces. Roughly chop the spinach leaves. 2. 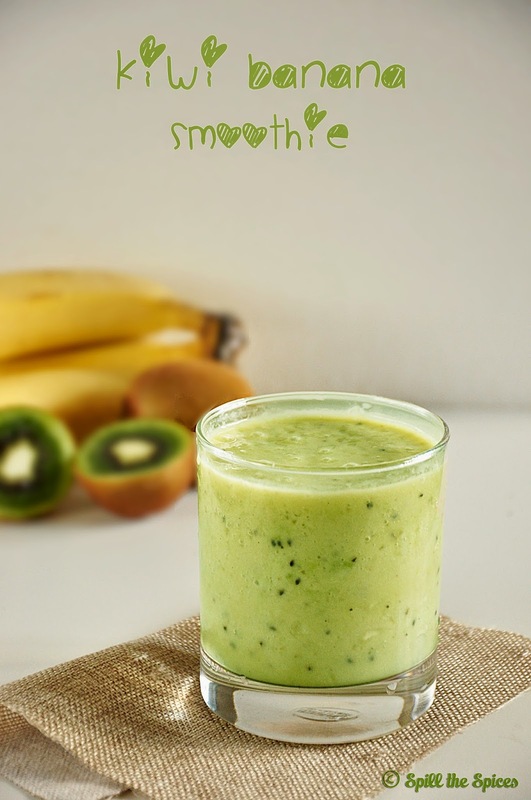 In a blender add kiwi, banana, spinach leaves, orange juice, milk, sugar/honey and blend until smooth. Pour into glasses and serve immediately. You can also add 2 tbsp rolled oats or powdered oats. You can also use yogurt instead of milk. Spinach leaves are optional. You can omit them. I am going to try this tomorrow and let you know..very tempting smoothie indeed!! 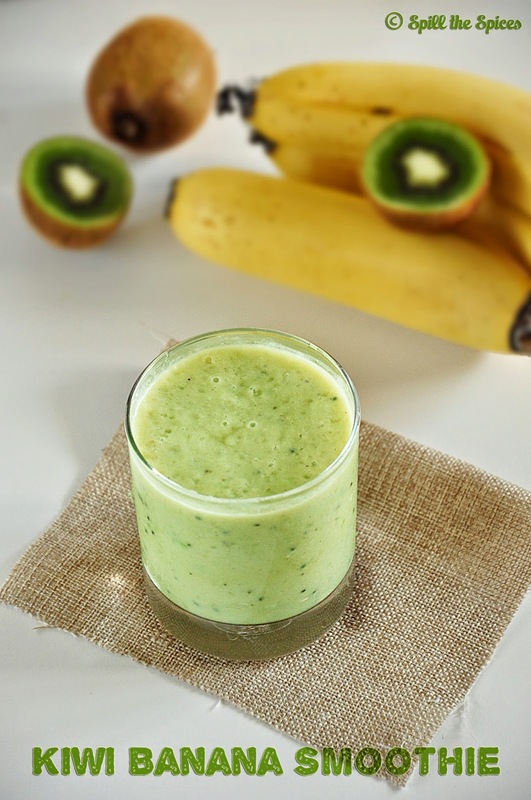 brilliant idea to add spinach leaves to a banana kiwi smoothie. This way you can taste the other fruits and not the spinach. I am hosting an event on my blog. Please participate by linking your recipes. Thanks. Looks like a delicious cup of smoothie! Delicious and healthy breakfast smoothie.. The addition of spinach makes it more nutritious. delicious and yummy smoothie dear.. lovely pics and color..
yummy and delicious smoothie.. i can happily start my day with this nutritious smoothie. The addition of spinach makes this smoothie more nutritious and healthy.. Lovely pics and yummy smoothie dear.. I am really in t green smoothies at the moment and I always put spinach in them. Lovely blend of two fruits.. never tried it. Looks nice. Can enjoy this any time...also can name it milk shake nah.pics r tempting.